Do you suffer from neck, back or shoulder pain and are in need of a trusted local Osteopath to help you from your discomfort? Richmond osteopathy clinic is located a short distance from Burnley and has certified Osteos that are ready to treat you. 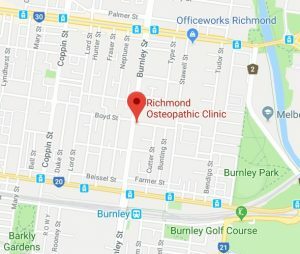 Getting to Richmond-Osteopathic Clinic is quick and easy due to the many options available from Burnley. If you’re feeling capable to drive, Burnley to Richmond is less than 2 kilometres away. Depending on traffic its only a 5 minute drive from you to us.